The US Mint has announced that a 2019-W Proof Cent will be included with all purchases of the 2019 United States Mint Proof Set, which goes on sale March 1. This is the first cent to feature the “W” mint mark of the West Point Mint. 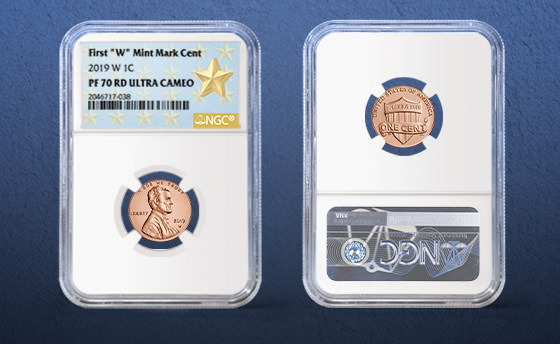 NGC is celebrating this historic coin with a special attribution of First “W” Mint Mark Cent, as well as NGC’s West Point Mint Gold Star Label, both of which are provided for no additional fee. Lincoln Cents have been struck for the past 111 years, typically with no mint mark (if struck in Philadelphia), a “D” mint mark (if struck in Denver) or an “S” mint mark (if struck in San Francisco). In 2017, a “P” mint mark was included on the Philadelphia issues for the first time to celebrate the 225th anniversary of the US Mint. Today, the US Mint branch in West Point, New York, is best known for minting commemorative and bullion coins in precious metals including silver, gold, platinum and palladium. However, before it was elevated to a branch mint, the West Point facility produced Lincoln Cents for circulation from 1974 to 1986. These had no mint mark and are indistinguishable from the Philadelphia issues. Now, in addition to the existing array of mint marks, collectors will be able to obtain Lincoln cents with the W mint mark.